The Blizzards were one of Ireland's biggest rock ‘n' roll deals, but that didn't stop their guitarist and singer Niall Breslin deciding in January 2010 that he needed a new challenge. "We had six amazing years together," he reflects. "The gigs, the fans, the other guys in the band... it was all brilliant, but I've always found myself being embraced by all genre directions. Not only as a writer and a performer, but as a producer too; I'm fascinated by every part of the music-making process." He has managed to combine both musical genres to glorious effect as can be heard on his debut solo single, ‘Can't Stay Young (Forever)'. A big-chorused synth-pop anthem that screams "Summer!" "The track was 95% finished, but I couldn't for the life of me think of a title until I was sitting there nervously waiting to get tattooed. The guy said, ‘Are you sure you want to go through with this?' and I went, ‘Well, you can't stay young forever!' It's the perfect summing up of what the song's about, which is "that I'm not 19 and in college anymore. There's some serious stuff I need to be doing and achieving in my life." Bressie's growing maturity as a songwriter is underlined by lyrics like, "In the sand I made wagers/Grabbed my chance and crossed that line/I've took risks and suffered failures/But 10 years later the stars align", which reflect on everything that's happened to him over the past decade of his life. ‘Can't Stay Young (Forever)' is the first taster from an as-yet-untitled album that follows in the Summer, and finds Bressie sharing the workload with Jimbo Barry. Together they've allied themselves to Simon Fuller's 19 Entertainment, whose managerial stable also includes such household names as Jordin Sparks, Adam Lambert, Carrie Underwood and Kelly Clarkson. It was Fuller & Co. that arranged for him to hook up in Brighton with Gomez singer, guitar and keys man Tom Gray. "We were supposed to be doing some writing for Olly Murs," Bressie smiles, "but that quickly got knocked on the head, and instead we came up with a really beautiful acoustic song called ‘Please Don't Break My Android Heart', which is going to be on the album." Wanting a particular ‘80s synth sound reminiscent of the days of his youth, Bressie booked into Sphere, the studio where Duran Duran assembled most of their new romantic-era classics. It's the same meticulous attention to detail you'd get from his production heroes Phil Spector, Dr. Luke, Max Martin and Paul Epworth. "One of the things I promised myself making this album was, ‘no half measures'. What a song needs, it gets - even if it drives your management and record company crazy!" Something, which he hasn't done much of these past couple of years, and can't wait to get back to, is playing live. "I don't know whether it's a subconscious pining for home, but even though I put together my band in London most of them are Irish," Bressie laughs. "I love doing my mad scientist routine in the studio, but live in front of an audience is still what it's all about. There will be a lot of people delighted to have him back. 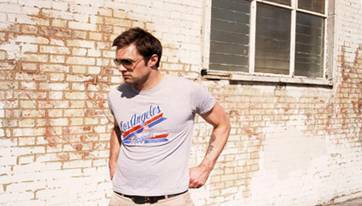 Bressie Plays The Ruby Room @ The Royal Theatre on Thursday 13th October.